Imagine a long-term solution for bunker maintenance that involves building it right and building it once. A solution that involves a traditional aesthetic while incorporating modern materials and technologies. What if you could do this in an affordable way with a nod to sustainability? The PermaEdge Bunker System gives golf course professionals the ability to address maintenance and renovation objectives by putting their capital improvement plan to work over a significantly longer life. This patented solution has been proven on nearly 60 golf courses, in 8 countries over the several years and continues to be refined, so that new design cues can influence the bunker aesthetic. Demands on the golf course maintenance budget increases pressure to do more with less. And when considering renovations, extending the life-cycle of these capital improvements is a significant objective. Professionals have been addressing these concerns over the years. With great success, for example, bunker liners have controlled washouts and eliminated sand contamination, cutting labor costs to repair. 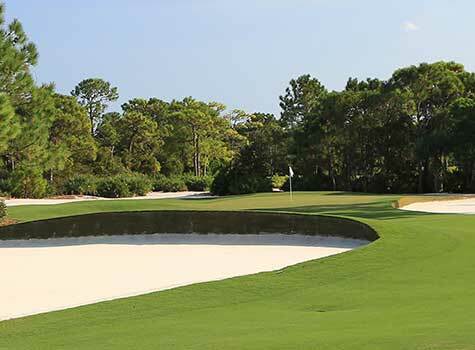 Based on design styles, bunker edges and perimeters could still pose challenges. No matter the design or style, bunker structures can get damaged by trimming, mowing, weather, decomposition, or by equipment entering or exiting a bunker. It is also about aesthetics. Nothing is more noticeable than bunkers in poor condition. With the primary focus typically on greens, tees, and fairways, bunkers too often get neglected or simply addressed for the short run. To reduce maintenance pressures, bunkers frequently get rebuilt into lesser states of their grander origins. They often take on more ordinary or utilitarian shapes. In some cases, bunkers get grassed in all or part. But for many, these new designs don't suit the course, especially on more historic locations. 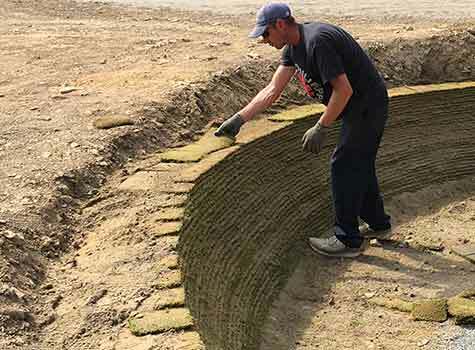 After playing a historic course where this had occurred, a goal was set to find a way of building ‘beautiful’ bunkers in a more maintainable manner. This was also true for links courses, where the revetted style proves exceptionally difficult to maintain. We reviewed a wide range of different materials and methods. Considerable testing and analysis was performed, with a conclusion that used synthetic turf would be the best choice. The next step was to set-up a test bed, using different turf, in different dimensions, with different materials and methods. A multi-year process resulted in our final solution. The PermaEdge Bunker System is not just about used synthetic turf. As a patented system, each component relies on every other for success. The solution involves sourcing, converting and preparing the used turf to a defined specification. It is also about site preparation, understanding a series of key principles to layout and design the construction processes. PermaEdge also involves defined assembly materials and techniques which will insure the system as a whole works over the long-haul. In short, PermaEdge stabilizes bunker structures with materials that will not deteriorate, will stand up to man's interactions, and will not erode with inclement weather. Most importantly, PermaEdge is adaptable to many different bunker styles. It gives designers a new tool in their creative toolbox. Richard Allen is from Wales. His extensive background as a Physical Engineer and active participant in golf course operations placed him in a perfect position to test and refine his original ideas. After several years of development, he has become a part of the PermaEdge / IVI-GOLF Team. Unlike facilities in the UK, the US market space has a wide range of architectural styles and a significantly larger geographic size. Working closely with the PermaEdge Team, this patented method delivers exceptional aesthetics, durability, and quality for the worldwide market. IVI-GOLF's background with the manufacturing, distribution, and sales of Sandtrapper bunker liners allows PermaEdge to become an extension of the Bunker Management product line, with extensive sales reach across the US and the globe. The PermaEdge Bunker System encompases many professionals across a wide range of disciplines. Over the past several years "The Invention" continually exceeds customer expectations in beauty, realism, and long-term performance. Currently under construction, the Meadows and Greenbrier courses are being renovated, improved, and reworked as a part of their long-term master plan. 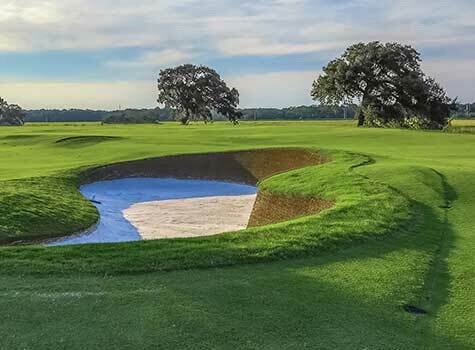 An old fashioned club in the traditional sense of the word, located in Beaufort, SC , designed by Bruce Devlin. Secession brings the Scottish Links to the low-country.